On the eastern edge of the medieval parish of Llanfair Dyffryn Clwyd, in the ancient commote of Dyffryn Clwyd. West-facing upper slopes of the Clwydian hills, between a height of about 250-350m, forming part of the Clwydian Range AONB. 18th- to 19th-century roadside stone cottages with slate roofs, some with outbuildings, generally on the common land above the road between Ruthin and Wrexham. Most of the cottages have been improved and enlarged during the 20th century. System of relatively large rectangular fields of improved grassland, cleared of bracken and gorse, and defined by quickthorn hedges probably representing enlargement of the adjacent pre-existing farms on lower-lying ground. 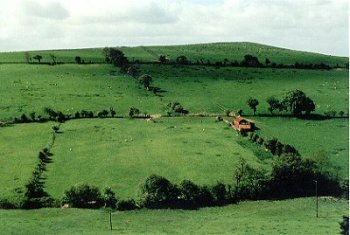 In addition some of the cottages are associated with relatively small parcels of land taken out of the common, again defined by quickthorn hedges. In places both types of hedges have been poorly maintained and in places have been repaired or replaced by post and wire fences. Most of the boundaries are shown on the enclosure award of 1853. Small roadside quarries, probably for house and wall building.